LinkedIn didn’t listen to a word I said. Jumping onto the resume reinvention bandwagon, LinkedIn introduced “visually enhanced” portfolios last week. As the name suggests, LinkedIn users are now empowered to add even more eye-candy to profiles. This means you can illustrate your greatest achievements in the form of stunning images, compelling videos, innovative presentations and more. From the analyst who makes annual predictions on tech trends to the 3D animator who is looking to fund a new short film, the opportunities are limitless for how professionals can now use the LinkedIn profile to help showcase these unique stories in a visual way. LinkedIn is getting dangerously close to Facebook territory. Dangerously close to slipping into “just another social network” category and losing its professional networking brand. I know the company is crushing it on many fronts. But this unending move to out-Facebook Facebook just seems like doing something for the sake of doing something. The recruiters I talk to want standardized resumes. That’s boring, I know, but boring is efficient. 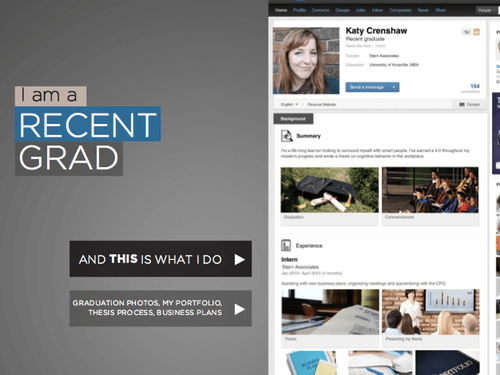 Sure, there are professions where pretty pictures make sense, but that’s not the message here, as LinkedIn uses “Recent Grad” as one of their fancy profile examples. Does that really say “Graduation photos”? How many recruiters want to use Pomp and Circumstance pics as a prerequisite for employment? In contrast, Indeed remains steadfast in providing an effective, simple platform for searching and submitting resumes. And they’re quietly growing an audience that loves said interface for managing those resumes. The more LinkedIn gets away from its roots, the more Indeed becomes a threat to its place in the market. Indeed is already the most popular place to search for jobs. By some accounts, more job seekers apply to jobs with their button than LinkedIn’s. The have commentary that gives Glassdoor a run for its money. And all the while, their stuff remains fast, mobile and search engine friendly. The point is, LinkedIn is going to lose its recruiting crown if it keeps up the arms race with Facebook, Twitter and all the other Valley darlings. Maybe that doesn’t matter. Maybe the dollars outside of employment are just too tempting. Maybe their blind with success. LinkedIn’s shareholders certainly don’t seem care. The stock is a Street favorite even after last week’s hiccup. Keep in mind, however, Monster’s stock used to be just as loved. it took Indeed less than 10 years to remake the job search space. It may take less than that to own the entire employment landscape.